I am a 49 year old lady who has fallen a few times (4-5) on my back going down the stairs. I have also injured my knees playing volleyball. I have been through four surgeries with total anesthesia, three pregnancies, delivered my children naturally, have 3 fibroids, and had a couple of car accidents. I have never followed a post traumatic set of recovery exercises for my back. Recently I enrolled in a Pilates class, because the right side of my lower back hurts. I thought I may have a problem with posture only, but recounting my history of falls, accidents and pregnancies, lack of exercise, and bad posture... plus aging and being overweight (probably 20 kilos extra), I find that Pilates offers me a good way to regain my posture and improve my breathing technique. I still have the pain in my lower back right side, my bones crack in that area when I stretch is that normal? What set of exercises do you recommend? Hello Maria and thank you for your story and question. My first suggestion for you would be to find and interview some equipment Pilates instructors who have experience with some or most of your issues. The back cracking does not sound good, might be arthritis, or worse. 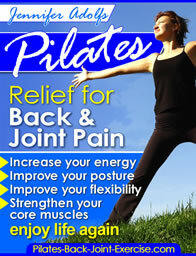 You should not have pain or a lot of noise when you are doing your Pilates exercises. A class setting is not appropriate for you until you develop some core strength and determine what exercises you should and shouldn't be doing. A class instructor is just too preoccupied with teaching a general Pilates class to be able to focus on all of your issues, unless you are in a very low level or fundamental small group class where they can give you modifications at the time. Pilates Ebook – Relief for Back and Joint Pain includes some of these modifications for specific exercises and addresses different musculoskeletal conditions.